What can I expect from the Tortola weather? 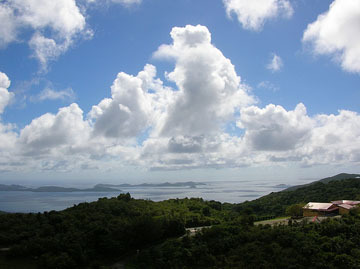 The Tortola weather is excellent almost all of the time. To give you the cliffs notes version let me refer you to the forecast. This will undoubtedly be the Tortola weather forecast for your vacation. Sunny with scattered showers throughout the day, with a high in the 80's and a low in the mid to low 70's at night. If you don't believe me just take a look here at what the experts say, if you can really call them experts. I know what your thinking, Why would I want to go to a place that's going to have scattered showers everyday? The answer is that often times it rains on some small part of the island and just a quarter mile away it's not raining at all. The last time I was there it was supposed to rain every day and I think I got sprinkled on for about eight minutes the whole trip. As most of you already know the British Virgin Islands do encounter hurricane weather from time-to-time. Hurricane season is from June-November, but by all means this doesn't mean you can't vacation here during these times. I would be very watchful in September and October, but I've been here in June, August, and September and never had a problem. One thing I always do is get the trip insurance, but since only savvy travelers read this site I'm sure you already knew that. It usually costs me about $30 per person and it really gives me peace of mind. No major hurricanes have hit Tortola for many years. Usually the island gets increased winds and surf (which the surfers love). The water can get a bit murkier and sometimes the beaches are effected. 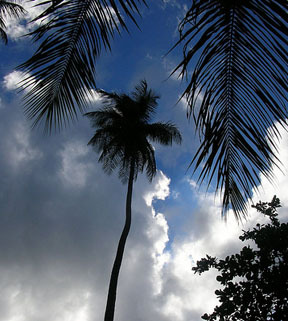 How do the seasons effect the Tortola weather? When you decide to take your vacation, look to the seasons to find out the right time for you. There are some seasonal variations that may influence when you want to come. December-February (Wintertime) You can expect a bit stronger trade winds, which make it ideal for renting that catamaran and going for a sail. Temperatures are usually in between 70-85, a stark contrast to where I live. At this time a year I like to go outside and scrape my windshield off. Winter is prime time for sailing throughout the Virgin Islands. March-May (Spring) The temperature increases a few degrees and the winds die down. This causes less surf and increases the clarity of the ocean. Thus making it the best time of year to snorkel and scuba. June-August (Summer) These are the warmest months, the temperatures can reach the mid 90s. During the summers here my favorite thing to do is start limin'. September-November (Autumn) The temperatures decrease due to more frequent showers. I often enjoy the short showers it helps me cool down a bit quicker when I'm out in the sun. Overall there is some seasonality, but for the most part just ridiculously good weather year around. If I had my choice though I would come in February. It's really miserable where I live in February, that's why it's my favorite month to go. To be honest I'd really just like to live in Tortola and not worry about a winter for the rest of my life!